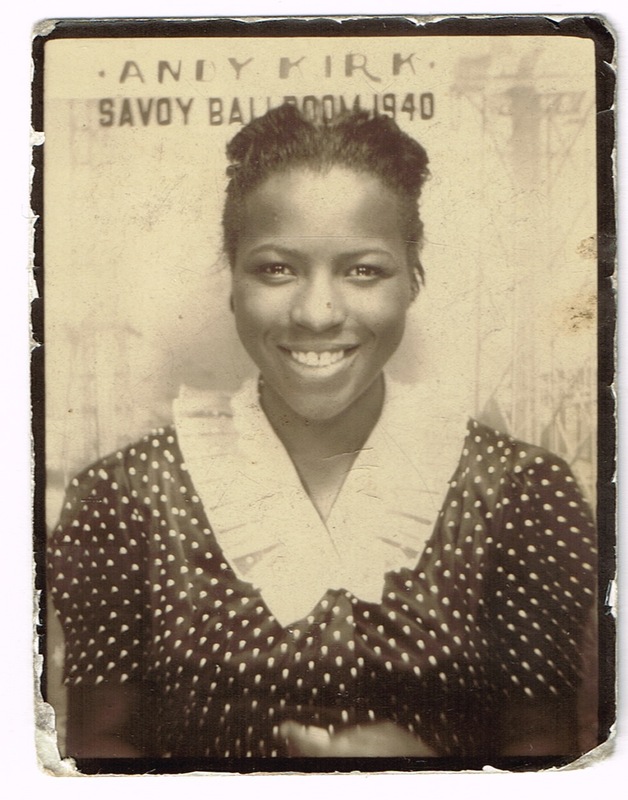 Above is another beautiful woman who stopped by the in-house photobooth at the Savoy Ballroom to make a souvenir of her evening out. She is glowing with joy, probably having been dancing up a storm to the big band sounds of Andy Kirk’s orchestra. 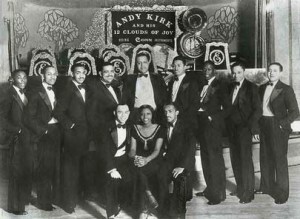 Andrew Dewey Kirk was a jazz saxophonist and tuba player, best known as a bandleader of the Twelve Clouds of Joy. His music was popular during the swing era, and he and his band performed regularly at the Savoy. He died aged 94 in 1992, having given up his musical career in the 1950s to concentrate on other pursuits. How the band might have looked on the night in 1940 when the top photobooth photo was taken. 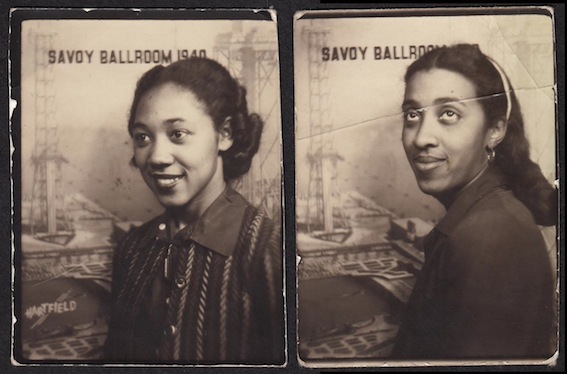 Also from the Savoy Ballroom photobooth, are the above two images, also dated 1940. Again two lovely women who, no doubt, had a passion for music and dancing. This subtly hand-coloured photobooth image is so full of history it is hard to know where to begin. The beautiful serene face of the sitter is what attracted me to this picture but the story behind it is what makes it come alive. If I were able to travel through time to any old photobooth location, this one would be my first choice. 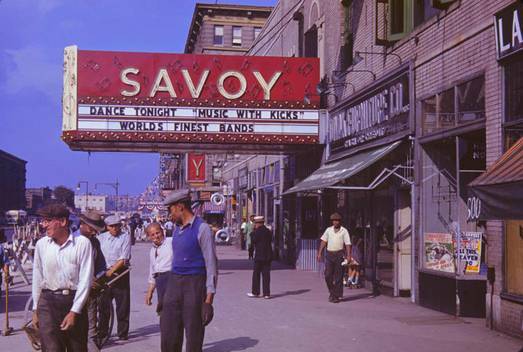 The Savoy Ballroom was a famous music venue in New York. It was owned by gangster Moe Paddon who, it is said, was working as a front for Chicago’s Al Capone. It opened its doors on December 14th, 1926 and closed in 1958. It spanned the whole block of 140th Street to 141st Street on Lenox Avenue in Uptown Harlem. There were different types of entertainment at the Savoy such as dancing professionals, dancing competitions and the famous “Battle Of The Bands” which pitted one band against the other. Usually Chick Webb‘s band would compete against another famous band, while the professional dancers would pick the winners. This usually brought the biggest crowds. Many famous musicians and singers started out or performed regularly at the Savoy, amongst them, Count Basie, Benny Goodman and Duke Ellington. Ella Fitzgerald won a singing contest at another venue in Harlem. 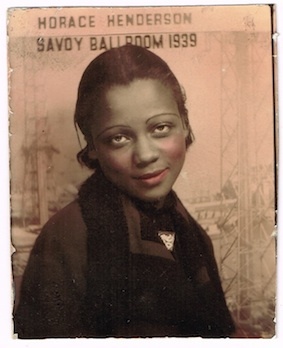 When she got a job at the Savoy as a dancer, someone told Chick Webb about her wonderful voice. He auditioned her and signed her as his premier singer. After his death, Fitzgerald continued Webb’s band. The Horace Henderson, mentioned at the top of the image, was an American jazz pianist, organist, arranger and bandleader. 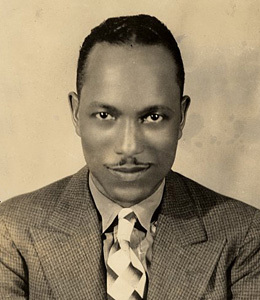 His band was known as the Horace Henderson Orchestra and then as the Dixie Stompers. He was a regular at The Savoy. I wonder if it was a tradition to put the bandleader of the night’s name on the backdrop of the in-house photobooth? The image in it is hard to figure out. Could it be radio towers, cranes from a building site or oil well rigs? Please let me know if you have any ideas what it might be.